Joshua Mali, MD, focuses his blog on individualized patient care in a private retina practice setting. 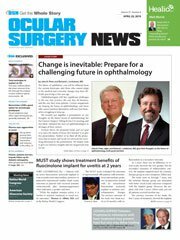 Much of the emphasis in retinal diseases is on current drug treatment regimens, investigating new agents and evaluating potential drug delivery systems. Equally important, however, is maintaining a focus on risk reduction and early detection, especially when it comes to age-related macular degeneration. As technology advances and becomes available to us for use in our clinics, it is our responsibility as physicians to make that new technology work for us and our patients. In order to provide the best possible care and visual outcomes for our patients, it is critical we continue to be the leaders of our field and explore cutting-edge technologies. The ForeseeHome monitoring device (FSH, Notal Vision) is, I believe, a “flagship” product for the use of telemedicine and artificial intelligence in the early detection of wet AMD. The device uses preferential hyperacuity perimetry, capable of detecting minute changes in the central visual field with a sensitivity of 80%; it was cleared by the FDA as a home monitoring device in 2009. The AREDS2-HOME Study compared visual acuity at the time of choroidal neovascularization (CNV) detection between 1,520 at-risk dry AMD patients who were randomly assigned to the device plus standard of care (self-monitoring with Amsler grid and routine clinic visits) with a control group assigned to standard of care alone. Results showed that, among patients who tested with the device at least twice a week, 94% maintained 20/40 or better visual acuity at diagnosis of wet AMD compared with 62% of eyes that used standard of care alone (P = .014). The HOME Study also found that patients who triggered an alert via the device between office visits lost a mean of three letters of vision compared with an average of nine letters of vision lost in the control group. The CNV lesion size in patients assigned to the standard of care group were approximately 300% larger than the study group. It is essential that we monitor and evaluate patients with dry AMD on a regular and consistent basis in order to detect significant changes in their disease process; however, more likely than not patients will convert from dry to wet disease when they are home and not in our offices. We know that, as is the case with most diseases in medicine, patients will have significantly better outcomes when the disease is detected early and treatment is initiated immediately after the development of CNV. Clinically, FSH helps to minimize the potential for vision loss; however, there is another benefit in clinical practice: peace of mind. My patients using FSH are reassured because they know that their vision is being closely monitored every day. This helps to alleviate their anxiety and helps to promote their overall wellness. Frequently and consistently monitoring bilateral intermediate AMD patients is important, but we should also consider the implications for those who already may have wet AMD in one eye and dry AMD in the other. Unfortunately, some of these patients have lost significant vision in the eye with wet AMD and therefore know the importance of identifying disease and initiating treatment as soon as possible. Without a doubt, these individuals really appreciate the value of home monitoring, and they want to do everything possible to maintain their vision. I am in a multispecialty practice with other providers, and we, as a team, manage a high volume of intermediate AMD patients. When the optometrists or comprehensive ophthalmologists in my practice see FSH candidates, they refer them to me as the primary retina specialist. I establish strong relationships with the other eye care provider(s) on the patient’s team to ensure timely management. We share responsibility for following and monitoring the patient. As the retina specialist, I receive the FSH alerts if the machine automatically detects significant changes in vision and retinal anatomy; then, I can initiate the proper strategy to achieve superior visual outcomes. It is important that we make technology work for us to continually provide our patients with the best care. Certainly, these advances do not replace the retina surgeon or any of the eye care professionals caring for and following AMD patients. Human history has shown us that our technological advances eventually catch up to us in every aspect of our lives; using the written word as an example, we have gone from pen and paper, to a typewriter and now to using computers. This evolution did not replace authors, it only made their jobs easier. Likewise, in ophthalmology, we have been using an archaic lined piece of paper — with a dot in the middle — to monitor patients’ vision. It is finally time to utilize our technology to advance this aspect of patient care. The ForeseeHome device, utilizing telemonitoring and artificial intelligence, is the next step. Home monitoring for patients with intermediate AMD is an evolution in technology that facilitates our diagnostic abilities and allows us to provide earlier treatment and ultimately better outcomes. Technology like this is a piece of the puzzle that makes us better doctors and allows us to provide better care for our patients. This represents what makes our field of medicine so dynamic, and it is truly an honor for me being able to take the lead as the retina surgeon. AREDS2-HOME Study Research Group, et al. Ophthalmology. 2014;doi:10.1016/j.ophtha.2013.10.027. Disclosure: Mali reports he is a consultant, speaker and stock shareholder for Alimera Sciences, a consultant for and recipient of research funding from Allergan, a consultant and speaker for Genentech, a consultant, speaker and stock shareholder for and recipient of research funding from Regeneron, a consultant and speaker for and recipient of research funding from Notal Vision, a consultant and speaker for Sun Pharmaceutical Industries, and a consultant and speaker for Macular Degeneration Association.